Nose cleaner is a new kind of fashion for baby care products, which possesses lots of advantage, like softness, high efficiency and easy operation. Since the babies no more than one year old can only breathe by nose, it is essential to clean their nasal secretion and mucus regularly in case of illness. When a baby has a cold, the nose cleaner enables the suction of mucus secretions that are blocking the nose and making breathing difficult. 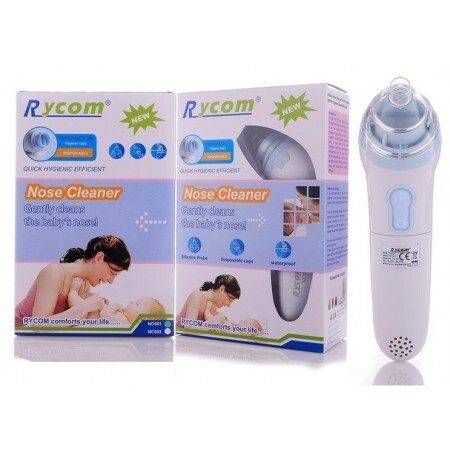 It is battery operated and just needs to be held under the baby&apos;s nose for a few seconds so that the suction effect will clear all the mucus into the cup of the cleaner, leaving the nose clear. Baby can then breathe easier again. The plastic cup can be thrown away or cleaned hygienically. The nose cleaner is waterproof and can be used with one hand while holding baby with the other arm. This is something that no family of babies/young children should be without, as it relieves stuffy noses in an instant, thus resulting in better sleep at night. Not applicable for nasal mucosal injury, redness nose etc.